How the iconic game became a portal to hell. There are currently 1,256 used Ouija boards for sale on eBay. Most of them likely got their start in dark basements and at middle school sleepovers, where children accused each other of moving the planchette as it slid over the cryptic letters. Who’s there? Who are you? You can almost hear them whisper now. Whether you call it a gimmick or earnestly believe it can summon the dead, its history is as mysterious as the very stories it creates. Self-described as a “link between the known and unknown, the material and immaterial,” even Ouija board historians (yes, they exist) struggle to find the exact origin. The problem is that the only people who can really fact check its powers are those who swear they felt hands brush against their neck, and the spirits who did the brushing. Too bad ghosts can’t be verified. Let’s do our best to piece together the mystical board’s insane backstory. It wasn’t until their worried parents sent the girls away from their “haunted” house that they revealed the truth: The duo had rigged an apple to a string to create the allusion of otherworldly communication. It may have been a low budget production, but the shtick sparked a high-impact movement called Spiritualism, the belief that the dead have the ability to communicate with the living, and vice versa. The Ouija we know today is a flat board with the alphabet splayed like a rainbow, with “YES” and “NO” written in the upper corners and “GOOD BYE” at the bottom. But the first versions looked much, much different. 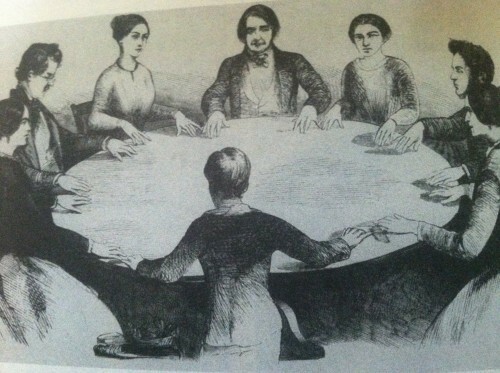 During the latter-half of the 19th-century, people started “table-tipping” to communicate with the dead. People sat around a table or dinette with hands placed gently atop the edges and called out to spirits. If the table inexplicably started to tilt, it was interpreted as a response from the supernatural. It was only a matter of time before industrialism stepped in to make “improvements” to human-to-dead communication. Soon enough, people started using alphabet cards or tiles to spell out messages with a planchette (that’s the heart-shaped device that comes with the game today). People who lost loved ones in the Civil War became obsessed with the idea of talking to the departed. 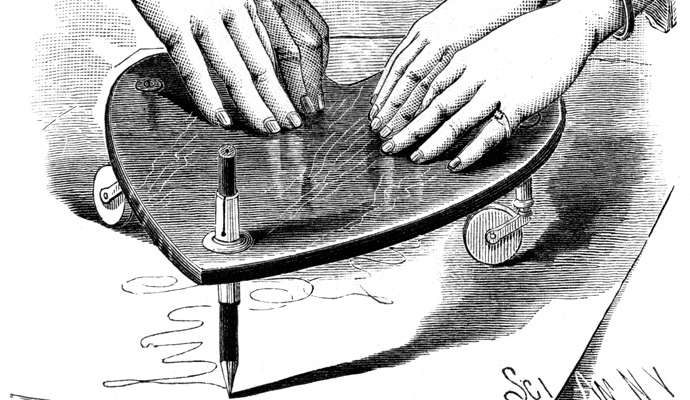 In 1886, the Associated Press ran an article all about the new “talking boards” craze. Just four years later, businessman Charles Kennard and a small group of investors capitalized on the trend by creating Kennard Novelty Co. — a company that made and marketed talking boards exclusively. The Ouija board’s most interesting selling point is the fact that it’s patented, which implies there’s quantifiable proof that it really works. After studying the patent firsthand and conducting interviews with descendants of Ouija’s founders, Murch was given insight into the narrative. According to legend, members of Kennard Novely Co. arrived at the patent office, where the chief patent officer demanded a demonstration of Ouija’s abilities. The officer challenged the board to accurately spell his name, which was said to be unknown by the creators. If the board answered correctly, he’d approve the patent application. The officer and two of the creators sat down to the board and asked the spirits to deliver the patent officer’s name. The planchette moved from one correct letter to the next, ultimately spelling the officer’s name. But the patent offers absolutely no insight into how the game works—just declares that it does. The ambiguous nature of its explanation works to the mystery nature of the device, positioning it well for marketing. Murch suggests even the creators weren’t sure how it worked. The Ouija board was an immediate success. By 1892, the Kennard Novelty Co. grew from one factory to seven worldwide. Trying to chat with the dead became a popular parlor pastime—from the late 1800s until the 1960s, the Ouija board was good clean fun. 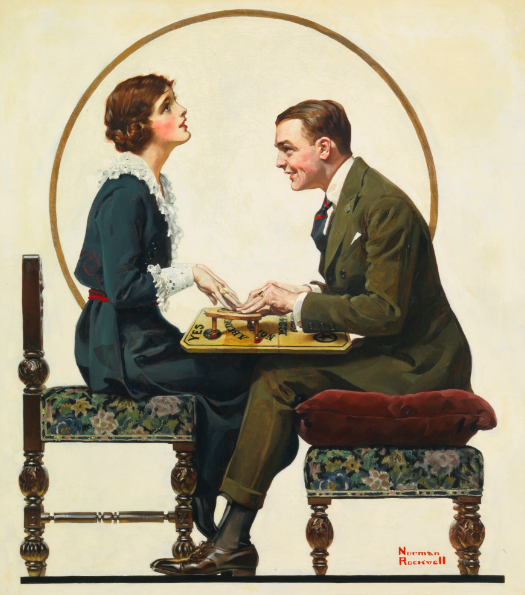 Norman Rockwell even created a painting of a couple playing the board for the Saturday Evening Post. There were some who claimed the Ouija was evil, but those cries came mostly from mediums whose jobs were threatened. It wasn’t until the iconic 1973 horror film “The Exorcist” debuted that the board’s entire reputation changed from silly to sinister. In the film, a 12-year-old girl becomes possessed by a demon after playing with a Ouija board. All the head spinning and crucifix-jabbing horrified viewers so much, the Ouija board became the devil’s board game overnight. Christian religious groups still remain wary of the board—Catholic.com calls it “far from harmless” and as recently as 2011, 700 Club host Pat Robertson declared that demons could reach directly through the game. The board’s long and profitable history is an interesting insight into a strange pocket of American culture. It appeals to people of varying ages, religious backgrounds, professions and education, because it offers an opportunity to believe in something. Although the mass-produced game is designed to look ancient, it’s really only 120 years old. 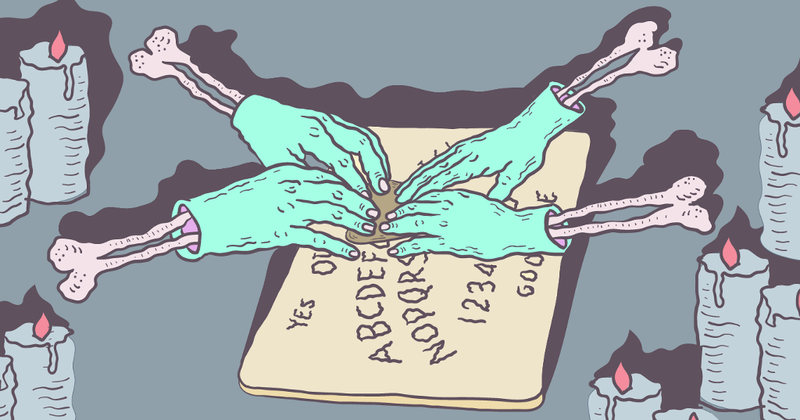 So, what’s the greater phenomenon — the Ouija board itself, or our fascination with the afterlife?